Obama - Why is the Economy Growing so Slowly? Discussion in 'Political Opinions & Beliefs' started by akphidelt2007, May 23, 2012. Like I have said for two years now. The economy will not get out of this rut until the Govt opens up their purse and starts doing what they always have done best... SPEND MONEY!!! Based on conservative logic, our economy should be thriving right now! Time to drop this ridiculous conservative ideology and start acting like Reagan and Bush! Funny how Republican's are blocking every attempt for Obama to increase jobs and economic growth and then complaining about Obama's job. Great tactic they got going on. If Obama were allowed to spend like previous President's, we would be fine right now. Perhaps because we have the most business unfriendly president in US History......? Truely amazing.....after Obama's FAILED 5 Trillion dollar stimulus.......you think the solution is to spend more. .....worese than doing nothing--Barack HusSame Obama and Keynesian economics. We have two priorities right now. Economic growth, and reducing our deficits. Unless you can in some way stimulate economic growth through better distribution of the tax burden, there's going to be a lot of Government spending involved trying to boost economic growth. Obviously in a $15 Trillion deficit, we can't afford this. Besides that, who is to say any new policy by Obama for economic growth will be effective? He lost a lot of respect and influence throwing taxpayer money into a failing new healthcare plan. He has the right goals, but he has a hard time reaching them with his political outlooks. I'm sorry, but we need a some one new in office. Can't spend more when it's all been spent. There is no such thing as running out of fake money. That's not even logical. The best solution would have been for the market to find it's bottom so it could find the right valuations and start back up again. The problem with trying to prop up failed markets is that it keeps them from finding the bottom and start turning around. No one wanted any pain so what they get in return is prolonged pain. The fallacy of the graph is that Obama started and continues to deficit spend like a maniac. Not growing that is a good thing, but basically not changing from Bush's last year with the bailout and stimulus is a bad thing. If we were to get to even 2008 spending, Obama's should show a negative annualized growth. Your conclusion is based on a chart FAIL. Allyou've proved is how wrong the "Wall Street" (whatever that means) forecast was. You want the recession to be even worse? There's lots more that could be spent. 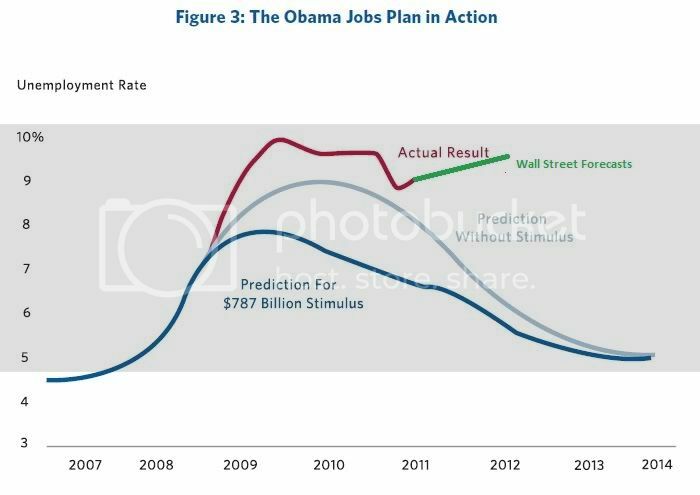 The entire stimulus was only about 6% of the economy, spent over 2-3 years. Lol, no one wanted any pain? Millions of people lost their homes, jobs, and retirements. I would say there was plenty of pain felt. And you want even more of that pain? You can't argue the data. The facts are facts. 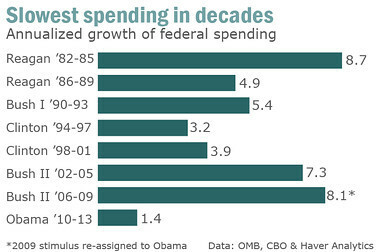 Obama relative has increased spending by the lowest amount in decades. We also have lost over 1 million public sector jobs after Bush increased public sector jobs by 2 million. It is factually incorrect to say that Obama is this big spending Keynesian when he in fact has spent less than the past 4 President's and significantly less than Reagan and Bush II. It's kind of sick how the Republican's are forcing this on Obama and then blaming him for the results. The high cost of energy - gasoline, diesel, and jet fuel cost double what they did in 2008 and the price of electricity is poised to quintuple - can't be helping. ..and what about the rest of us who will lose the value of our savings as inflation eats away at it? To hell with all of us right? I'd be in much better shape if your keynesianism would just go away and stop inflating away my savings and the value of my wage! Idiots like Krugman say "oh.. we should have 4-5% inflation a year." (*)(*)(*)(*) THAT. My wage does not go up 4-5% a year!!! My savings account does not increase by 4-5% a year! What you want is a back door transfer payment from people who have money owed to them, to people who owe money. He hasn&#8217;t &#8220;spent less than the past 4 Presidents,&#8221; you absurd individual. As evidenced by the graphs posted on the first page by another poster, current spending levels are higher than they&#8217;ve been under any other President. In fact, in Q2 of 2011, spending levels were at record highs. The only reason it seems so dramatic is due to the juxtaposition of annual spending growth rates of a fiscally responsible President (Bill Clinton) followed by a big spending Keynesian President (George Bush) followed by another big spending Keynesian President (Obama.) It&#8217;s the difference between Clinton and both of these clowns that&#8217;s dramatic, not the difference between the two clowns. You have an inability to analyze and interpret graphs. You are no longer allowed to post any. Having said that, you keep referring to the Bush years and to the deficit spending that occurred. Are the Bush years really something that we want to duplicate? Even if we compare him to his predecessor (who was fiscally responsible) is there anyone other than deranged neconservatives who believes that the economy was in better shape (as a function of the usual economic indicators) under Bush than under Clinton? Anyone at all? Idiots like Krugman say "oh.. we should have 4-% inflation a year." (*)(*)(*)(*) THAT. My wage does not go up 4% a year!!! My savings account does not increase by 4-5% a year! Why wouldn't your wage go up 4% a year? Q: Why wouldn't your wage go up 4% a year? 1) I didn't ask you. 2) Your response makes no sense. Because private sector businesses do not work that way. Only Government employees who can elect their bosses get that kind of raise. Many private sector businesses are still on wage increase freezes until the economy improves. Most people are only earning 1-2% raises if anything at all. He hasnt spent less than the past 4 Presidents, you absurd individual. As evidenced by the graphs posted on the first page by another poster, current spending levels are higher than theyve been under any other President. In fact, in Q2 of 2011, spending levels were at record highs. The only reason it seems so dramatic is due to the juxtaposition of annual spending growth rates of a fiscally responsible President (Bill Clinton) followed by a big spending Keynesian President (George Bush) followed by another big spending Keynesian President (Obama.) Its the difference between Clinton and both of these clowns thats dramatic, not the difference between the two clowns. You have an inability to analyze and interpret graphs. You are no longer allowed to post any. Wow, you are so dumb you can't even understand a simple graph. Embarrassing! Well I'm sorry, but I rather people not suffer just because you personally can't increase your net worth at a faster rate than inflation. .........and the lunatics belive the answer to our economic ills is for the most expensive president in history....to spend even more. We are talking about spending, not debt... get with the program.